Idea for preventing all future crimes: install trackers in those creepy plastic masks that are only ever used by budding criminals. They're a clear giveaway that a heist is about to go down. That's a lesson still to be learned by the guard in this teaser for Overkill's Payday 2. He's far too nonchalant for someone being approached by a guy equipping a sneering stars and stripes face mask and wearing surgical gloves. Unless he's assuming it's a particularly theatrical GP. The original Payday was an enjoyable, if shonky, co-op experience. For the sequel, Overkill seem keen to really nail the atmosphere of a tense crime caper. The new Crimenet acts as a dynamic mission database, with players progressing from convenience store burglaries through to full bank raids. It also offers four professions - Mastermind, Enforcer, Ghost and Technician - with new skill trees offering a variety of upgrade paths. Although how a Mastermind contestant is going to help you commit a robbery remains to be seen. 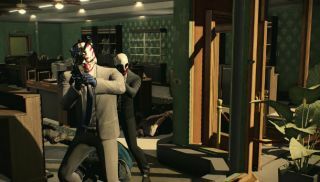 Payday 2 is due out this Summer. You can see more footage below, courtesy of CVG .